A series of guided tours along of Gloucester Road, specialising in charity shop clothes, craft beer and food were launched in March, helping shoppers explore the many delights and specialisms of the myriad of shops that make up Bristol’s Independent Shopping District. The Gloucester Road tours are a fun and accessible way to work with a personal stylist on the longest stretch of independent shops in the UK with clothes and accessories galore. Shoppers spend 15-20 minutes at each stop browsing and trying on fantastic garments while learning about styling trends, what colours and shapes suit you best and some simple styling tricks. The first Charity Shop Style event was a big success. 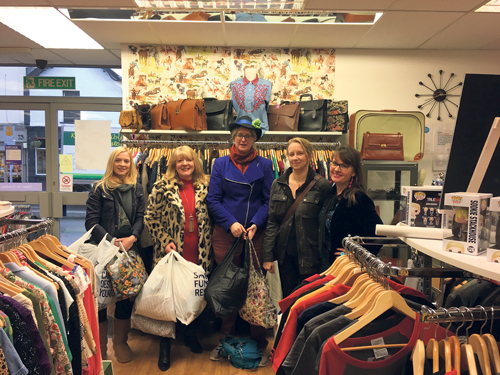 Personal stylist Becky Barnes, took a group of fashionistas on March 9 to hunt out pre-loved clothes, helping the ladies make the most of the items in each charity shop. Becky is massively enthusiastic about supporting charity shops, eco shopping, and reusing, but definitely has that eye to spot a designer bargain! Meanwhile, those on the tour have come away with a new found love for shopping in this eco-way whilst supporting the work of some amazing charities. If you haven’t got a clue where to start when you’re in a charity shop, have no idea what suits you or you simply fancy experiencing what it’s like to shop with a personal stylist, then this is for you.